The DLC is free to anyone who bought the original game. Now that Star Wars: Battlefront game is officially here, there’s really only one thing fans of the game can sit waiting for with great anticipation. 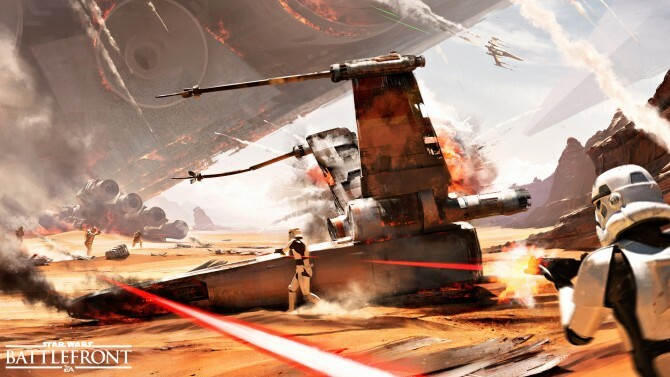 The free DLC, the Battle of Jakku has been something that has drawn a lot of interest since it was announced it was coming and that it would be completely free for those who already bought the game. Other than knowing this DLC is coming next month, there hasn’t been a ton of info about the extra content, but earlier this week, EA made some more information available on its official website that will get us ready when the DLC is finally launched. Along with this new content, there are going to be two new maps brought to the game, which will be a welcome addition considering there aren’t a ton of maps to choose from right now. Graveyard of Giants will allow players to play Supremacy, Fighter Squadron, Walker Assault and the new mode also coming with the DLC called Turning Point. Goazan Badlands is the other new map and will allow players to play the modes, Blast, Drop Zone, Droid Run, Cargo, Hero Hunt, and Heroes vs. Villains. In Turning Point, the Rebels spawn in and need to locate three control points in Imperial control and try to capture one of them. The clock is ticking, but if the Rebels succeed with a capture additional time will be added and new control points will be available for capture. Moving through these increasingly challenging checkpoints, the ultimate goal is the Empire’s base where the final stand will take place. Star Wars: Battlefront ‘s Battle of Jakku will be available on December 1 for people who preordered the game and available to everyone else on December 8.